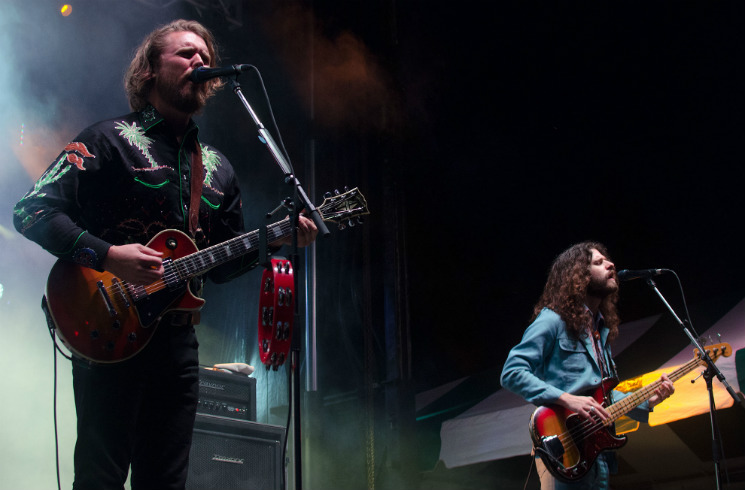 Not only the name of their most recent record, "Future Nostalgia" is a fitting description for the tone of the Sheepdogs' Riverfest 2016-ending set. Decked out in a vintage sequined shirt, Ewan Currie was as smooth of voice as he was in laying down a crunchy two-guitar attack alongside Jimmy Bowskill through catalogue entries old and new, from "Southern Dreaming" to "Same Old Feeling," "Back Down" to "Downtown." Not a note was missed, though the set remained a little short on musical surprises until the end, when younger Currie brother and keyboardist Shamus took centrestage on his trombone for "Ewan's Blues," which soon segued smoothly into Future Nostalgia cut "Help Us All." In telling the crowd that there's no place like Canada to experience live music during the summer, Ewan and the band treated the Riverfest crowd to an encore cover of Neil Young and Crazy Horse's "Down By the River," because there really isn't a more fitting song for the environment. It was also the first time for many in the audience to hear guitarist Bowskill, who joined the band as a full-time member towards the end of 2015. He needed little time to prove how natural of a fit he is with the group, flashing his blues-rooted solo skill with a pedal steel guitar on "I Don't Get By" and "Plastic Man."